This post is one of the harder ones for me to write about our wedding day because there is SO much I want to say! Linda with Accent Floral Design and I have been working together for so long and I truly LOVE her work! 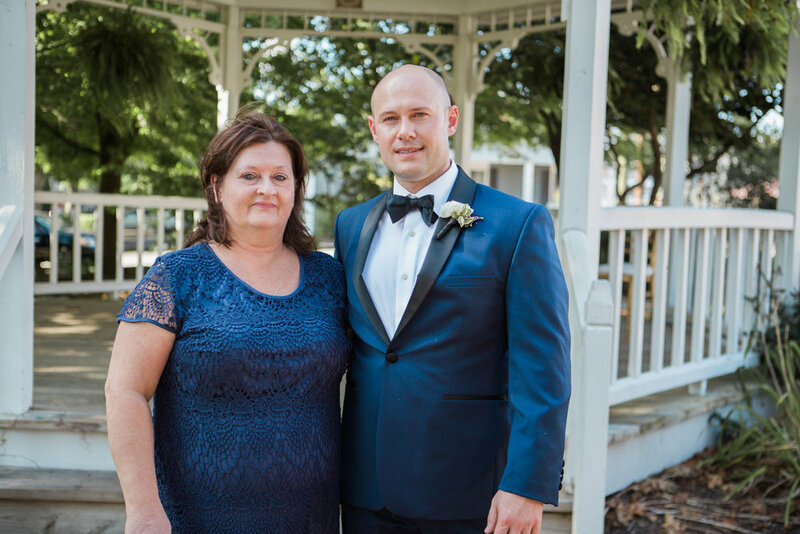 She has been taking care of clients of mine for years and she even helped my sister with her wedding 6.5 years ago! She has since become a dear friend and we've done many weddings together and even travel the world! Nothing like finding inspiration for weddings in Italy, right?! I am thankful for her talents as a florist and her honesty and kind heart as a friend! She will also keep you laughing and drinking wine in her free time! She always blows me away on wedding days! I usually ask, are you sure we payed for all these?! The flowers are always lush and beautifully put together to execute whatever vision the client and I worked to create! 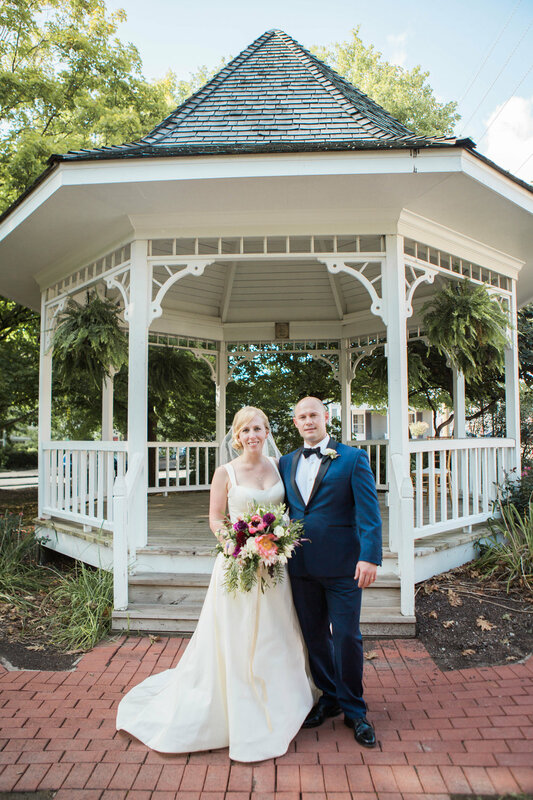 She has versatile style and adapts to make each client's dreams come true! 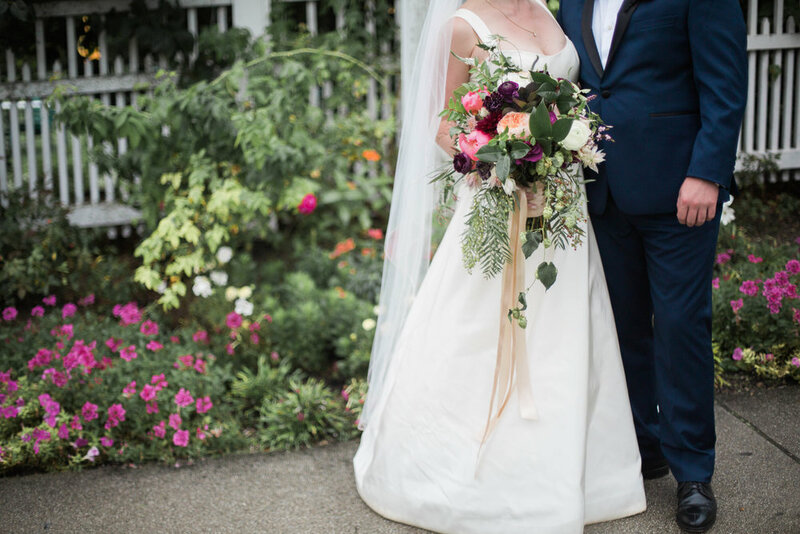 Not everyone is a big flower person but I have grown to LOVE flowers in my years as a wedding planner so I had very very high hopes for ours on our wedding day! 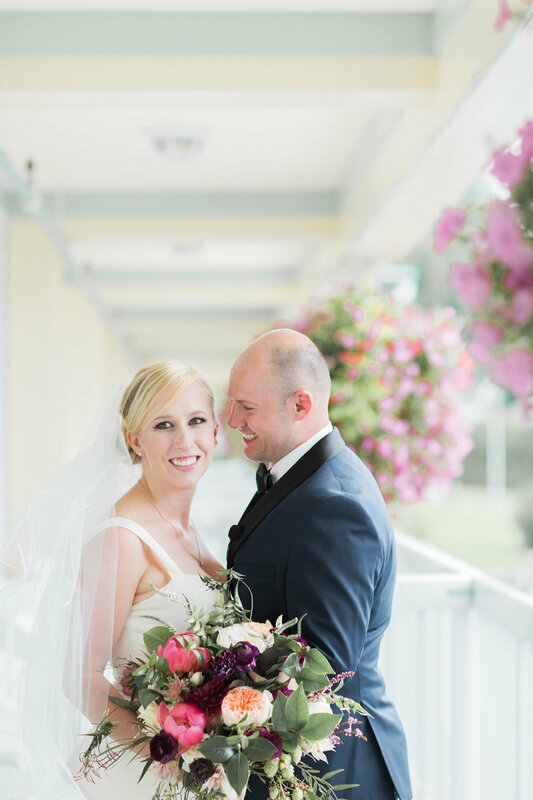 Linda not only blew me away but they were so great my husband couldn't stop commenting on them or our guests and even the hotel staff said it was the most beautiful wedding reception they'd ever had largely in part to the gorgeous floral! I'll try to break down what was wonderful about each element as they're so many I love! See full vendor list at the bottom! 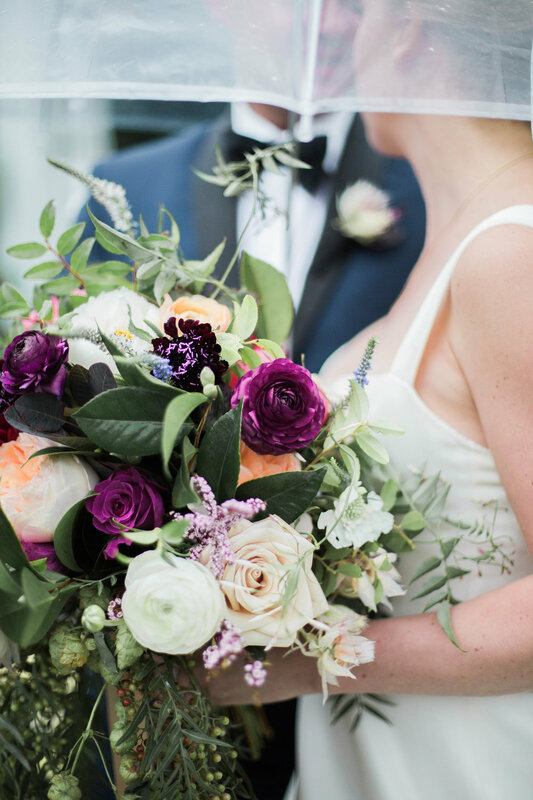 My bouquet: I could write an entire blog post about how much I loved my bouquet alone! Poor Linda, I wanted a million flowers that I knew weren't in season but she worked so hard to find everything I asked for and replaced things that couldn't be found with other things I loved just as much! Also, if you have two ceremonies you get two bouquets! You can see the pictures below of my Indiana and my Michigan bouquet! They were both stunning and different from one another! I still can't pick a favorite! 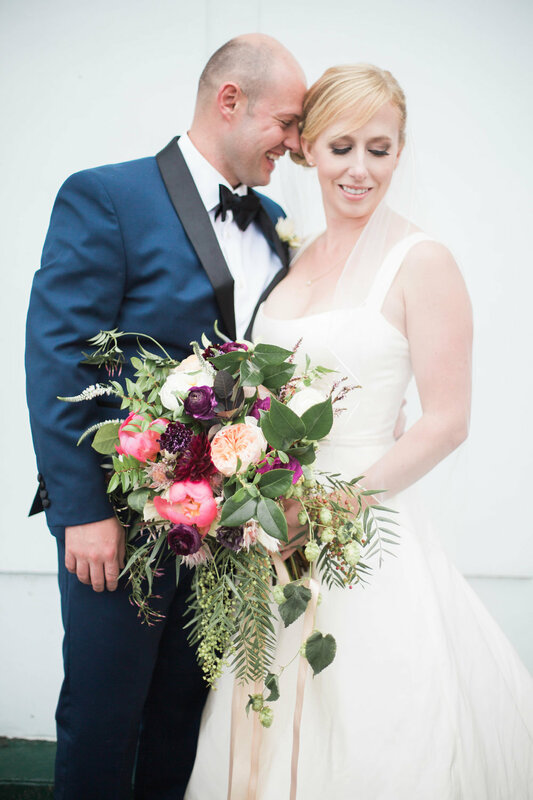 My favorite flower is the coral charm peony and my bouquet was accented with those as well as the reception. 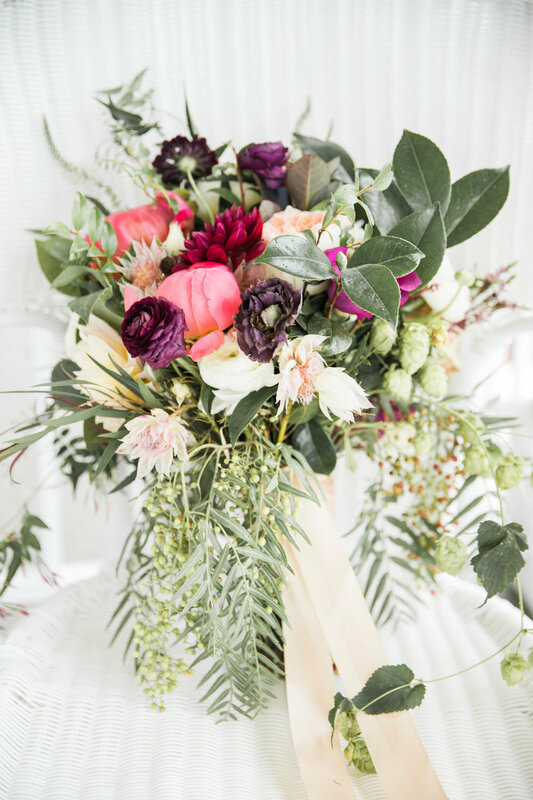 Other favorites are: peonies is other colors, burgundy and ivory ranunculus, dahlias (I had both light and darker ones), blushing bride protea, juliet garden roses, hops, and lots of different varieties of greenery! I wanted it to be diverse in flowers and textures. Linda did just that! 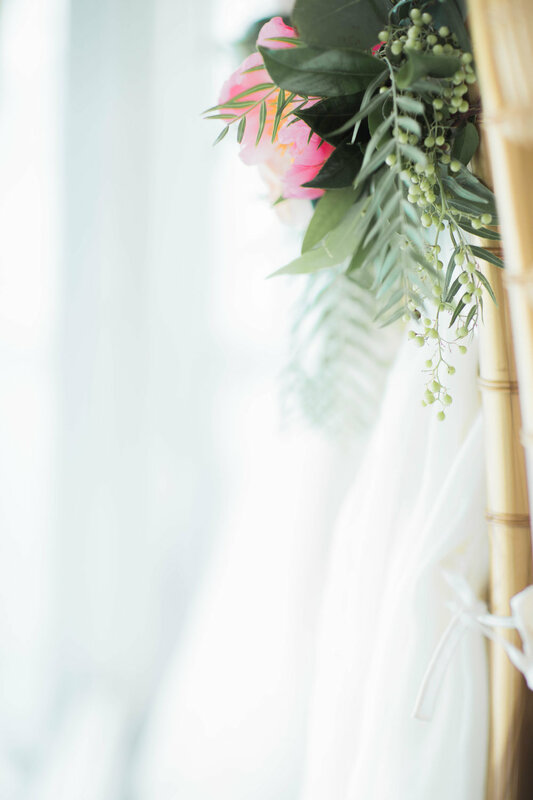 Lots of different greenery gave the bouquets a unique drape and flow. The only color in the day was in the flowers and they were a hit! I also wanted very specialty ribbon. It is hand dyed from Silk & Willow and has a beautiful look and feel! My Indiana bouquet also had champagne grapes which were a subtle delicate addition. There's also a picture of where my bouquet found it's home at our reception which was at the entrance with guests champagne seating assignments. 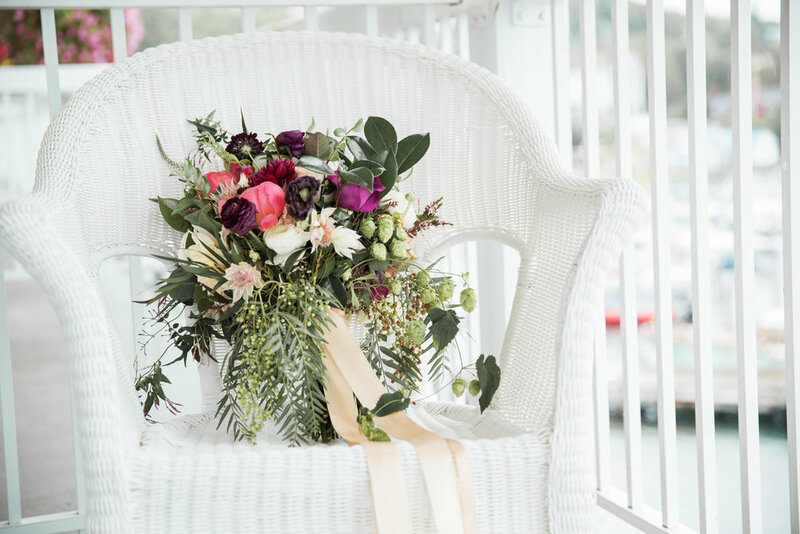 Bouquets should always have a home at your reception and our tables were too full so this was the perfect thing to soften that area as guests entered. There is also a picture of me with my mom. She has a love for flowers like no one I know. She taught me all that I know about gardening and she has the greenest thumb! I'm lucky to have her and I'm so glad she kept my Indiana bouquet as we went on to Michigan because I know how much she enjoyed it! Jake's boutonniere: Again the great part about two ceremonies?! Two boutonnieres!! 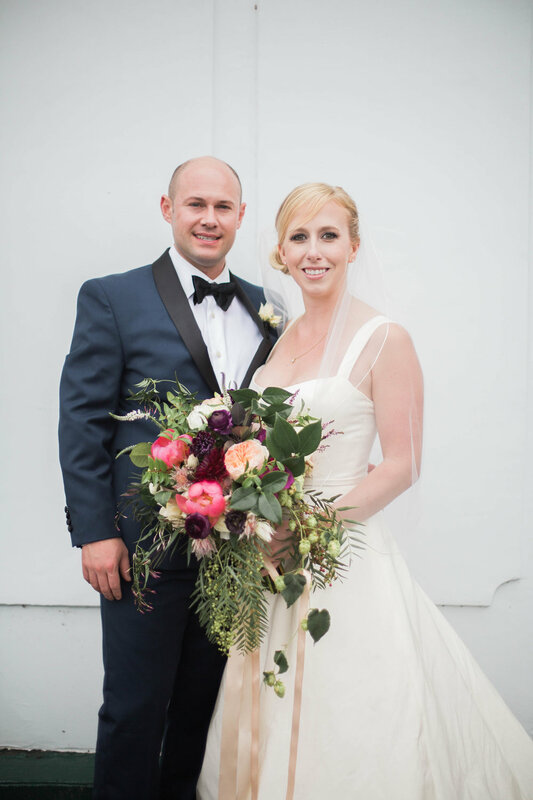 Jake had a blushing bride protea in Mackinac and an ivory ranunculus in Indiana. I love both and couldn't pick so we did different ones at each ceremony. I love them both and still can't pick a favorite. 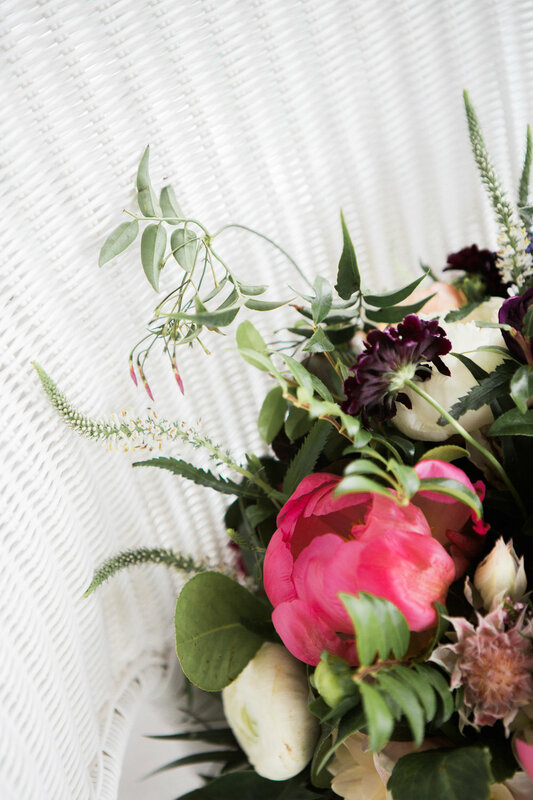 I love the traditional classic touch of the ranunculus but I also love the cool sleek more modern touch of the blushing bride protea! Jake loved them too! It was fun to get to surprise him with all these details on our wedding days! Ceremony decor: We wanted to keep both our ceremonies simple. In Zionsville we were in a beautiful park so we didn't have any ceremony decor there outside of my bouquet. In Mackinac Linda made these beautiful garlands that wrapped around where Jake and I stood. It's a very Hawaiian thing (Linda spend 15 years living in Hawaii) and we loved it as we honeymooned in Hawaii and Jake is still trying to figure out how we can move there :) The view was really the focus in Mackinac as we went there for the water! We were fortunate enough this beautiful tree was in full bloom too while we were there! 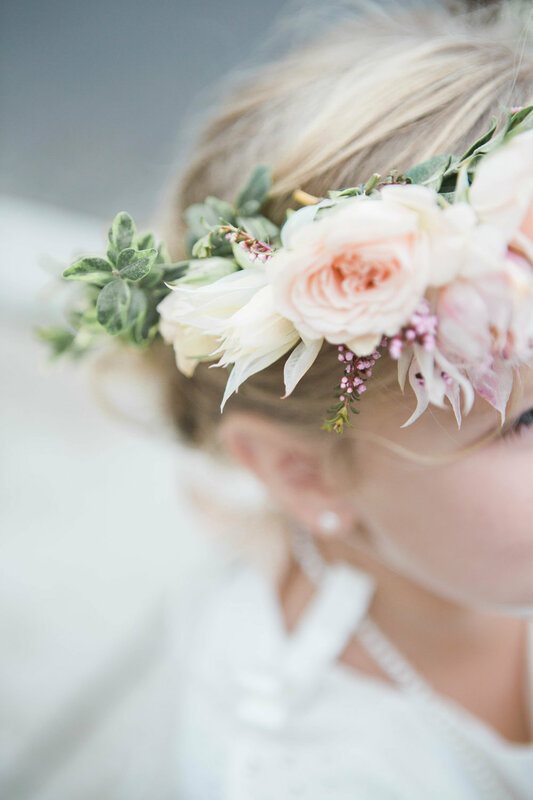 Flower crowns & little girl's bouquet: I mean, let's start with how cute Enzo's face is in the first picture below!!! He sure loved being with all the pretty girls :) We decided not to have a traditional bridal party and we just had all our nieces & nephews in the wedding! The three cuties you see below with Enzo are sisters and were angels all day! 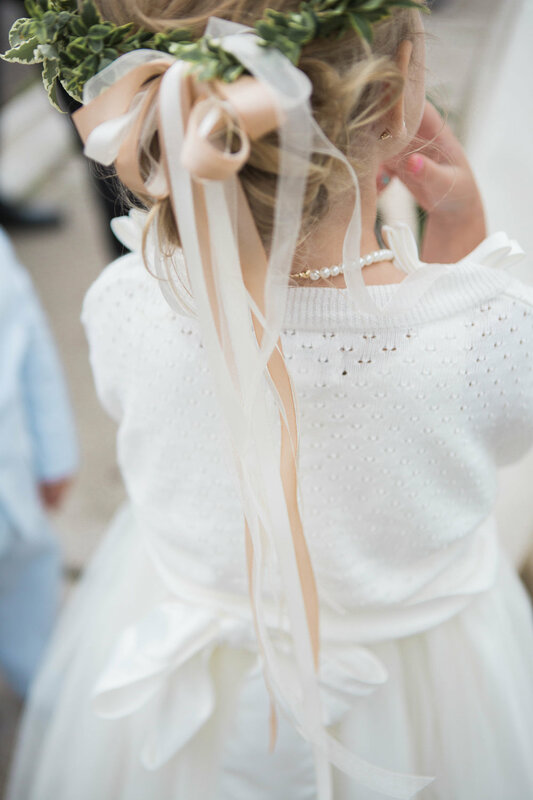 I love an asymmetrical flower crown on little girls with long ribbons and Linda just blew me away with these! The girls loved them too! My sister's little one wasn't into cooperating for a group picture in Mackinac, also had the cutest flower crown and at our Indiana ceremony where she did her job flawlessly! 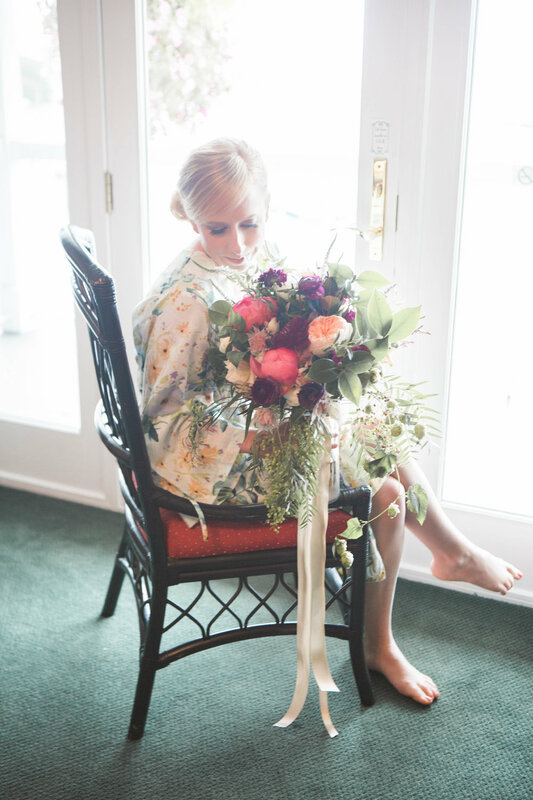 She had the cutest mini-bouquet in Indiana. She carried it so carefully and it was the perfect thing for 1.5 year old! These little accents make the cutest part of your day even cuter! 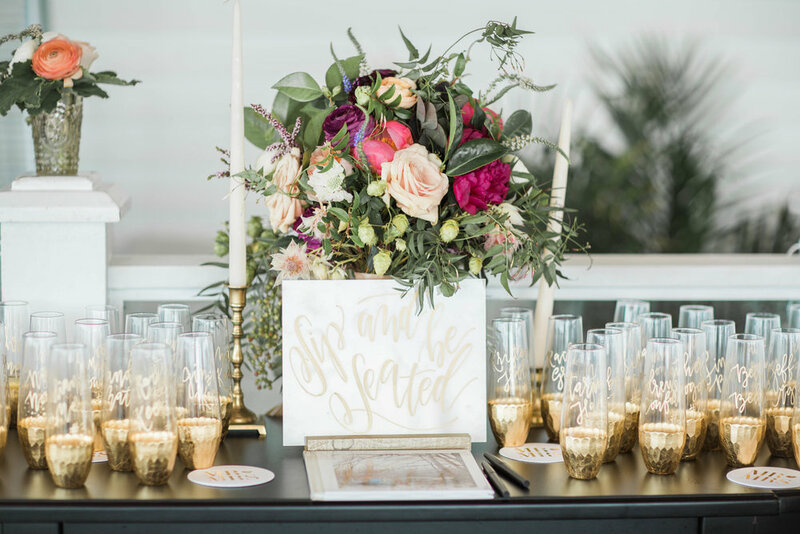 Reception decor: Easily my favorite part of the floral! The big show! the RECEPTION! As you can quickly see my motto for our wedding flowers was too much isn't enough! I LOVE flowers! So I wanted the tables to feel drenched in flowers which they did! There were 5 large arrangements in the most beautiful footed mercury glass. There were small lower julep cups filled with flowers. 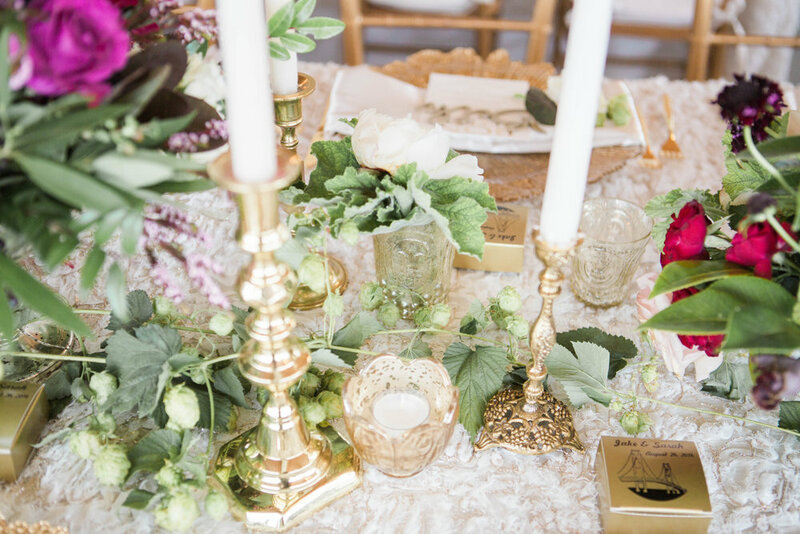 There were hops, fresh fruit, and open blooms tucked in around all the arrangements so no detail was missed. 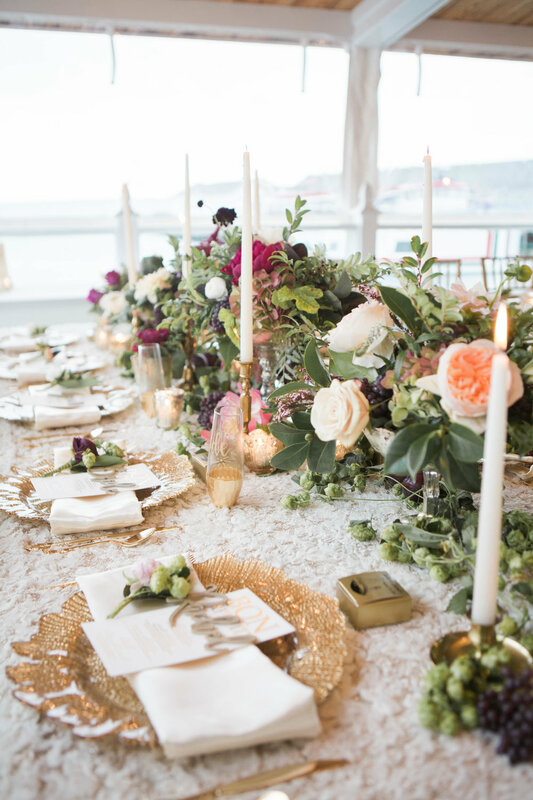 Linda also provided the beautiful taper candles and gold & champagne votives that made the space feel so magical once it was dark! We had a fresh bloom with some greenery at each place setting too! I wanted no detail overlooked! The variety of flowers was heavenly! 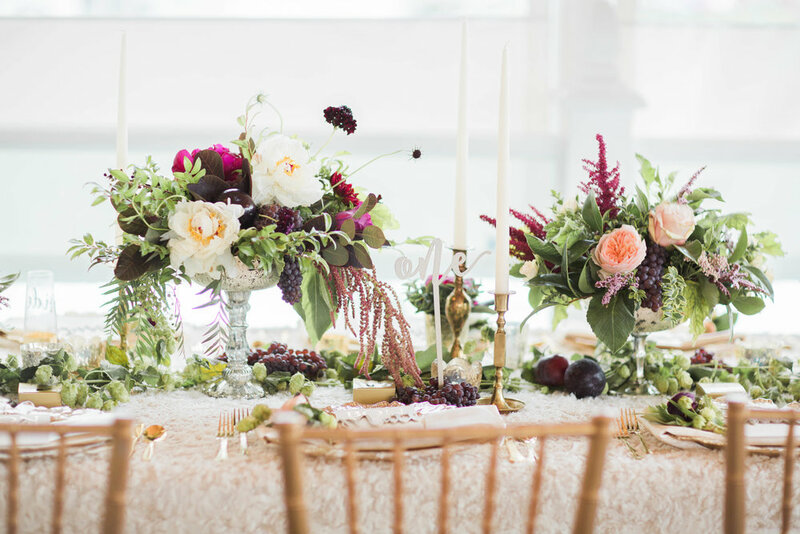 Lots of burgundy with creamy peaches and ivory flowers and pops of vibrant pink with the coral charm peonies! Lots of different greenery, berries, and fresh fruit! Asymmetrical in the best way! Nothing round or no two perfectly the same! I love that look too but it just wasn't what we were going for here! The greenery on our welcome sign was one of my favorite things! It looked so lush! I also died over how perfectly Linda execute my vision for the back of Jake & my chair! I cut custom fabric weeks in advance and she adorned them PERFECTLY with fresh florals and greenery! Each arrangement was unique which was exactly my vision. I wanted each one to feel special! They all had champagne grapes and plums (totally Linda's doing - when they didn't have pomegranates that we had talked about she chose plums for Plum & Poppy!). I loved this! Every food station had a beautifully accented sign that just made every detail feel well attended to!